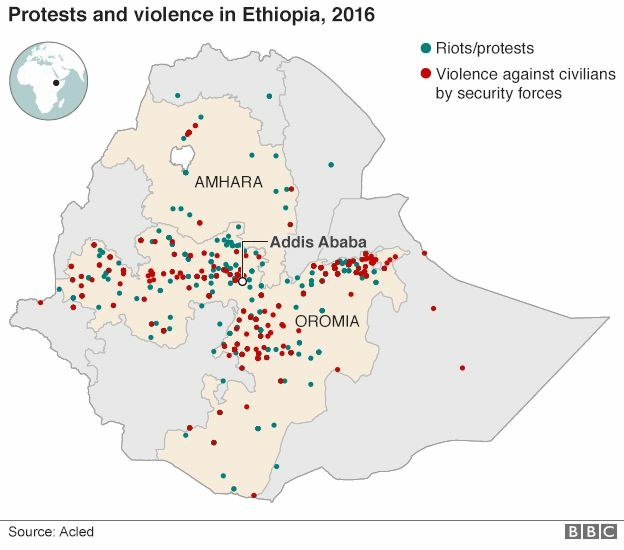 Ethiopia rights body: 'More than 600 protest deaths' - BBC – Satenaw Ethioopian News & Breaking News: Your right to know! 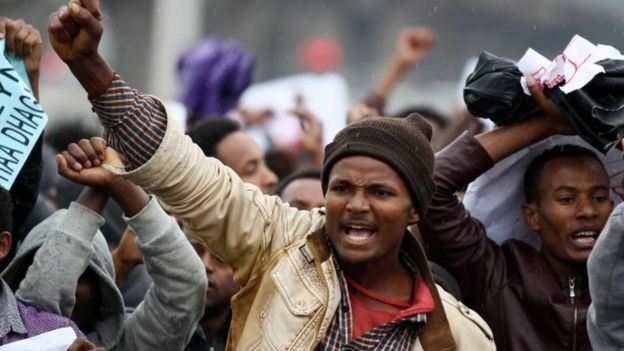 Ethiopia’s state-affiliated Human Rights Commission says 669 people died, including 63 policemen, in the wave of anti-government protests that began in November 2015.
International rights groups have said hundreds of people lost their lives in clashes between police and protesters. The report praised security forces for showing restraint in some instances and blamed diaspora groups for the trouble. Last year, the government imposed a state of emergency in response. 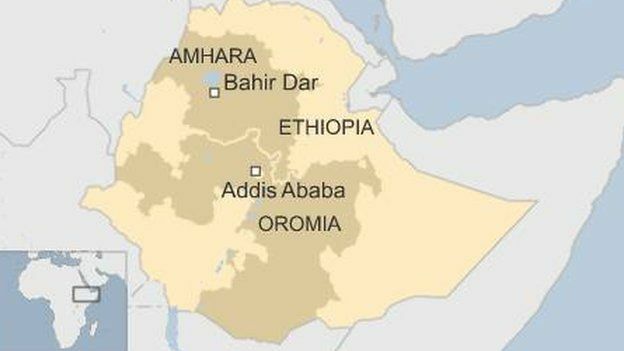 Activists from the Amhara and Oromia regions had been complaining about political and economic marginalisation. The Southern Nations and Nationalities Peoples Region also experienced some of the violent demonstrations. The report listed land rights, corruption, unemployment and bad governance as reasons for the widespread protests. It blames the diaspora-based Oromo Media Network, and satellite TV channel, ESAT, for inciting the violence witnessed in August and October 2016, when hundreds were reportedly killed. The report praises security forces for showing restraint during a traditional celebration on 2 October last year when dozens died following a stampede. It however recommends prosecution of some individual police officers for their actions, the following day, when dozens are believed to have been shot dead. Earlier, Ethiopia’s Prime Minister Hailemariam Desalegn had for the first time rejected calls by the UN and EU for independent investigations into the deaths saying the country was able to carry out the investigations itself. Mr Hailemariam told the BBC’s Emmanuel Igunza that an investigation by the Human Rights Commission, a body created by the constitution, was the only way of dealing with the issue. In the past, the government has disputed figures by international rights organisations saying that the security forces were responding to what were described as “anti-peace forces”. He said that the commission was an independent institution but admitted that it “lacked capacity” and said that it could be strengthened. He added that Ethiopia’s sovereignty should be respected and rejected the call for external investigations. Zeid Raad Al Hussein, the UN High Commissioner for Human Rights, last year called for international observers to investigate the killings after accusing security forces of using live ammunition against protesters in the Amhara and Oromia regions. A call that was reiterated by the EU in October and repeated last week. The prime minister also defended the state of emergency, imposed in October last year, saying it has brought “normalcy” to the country. He said the recent four-month extension of the emergency law by parliament was “necessary to consolidate some of the gains that the state had achieved in instituting reforms”. Mr Hailemariam said that the government has been focussing on solving the unemployment issue, especially among the youth, which he admitted had “brought resentment”. He said that the thousands who were arrested in a nationwide crackdown were still being held in prison and will have to go though the judicial process. Is there a secret project of declaration of independence of the Tigre region?